Dot Matrix Charts display discreet data in units of dots, each coloured to represent a particular category and grouped together in a matrix. They are used to give a quick overview of the distribution and proportions of each category in a data set and also to compare distribution and proportion across other datasets, in order to discover patterns. 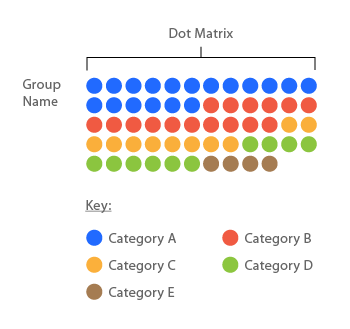 When only one variable/category is used in the dataset and all the dots are the same colour, a Dot Matrix Chart can be used to primarily show proportions.